Since its creation, the main aim of Consorcio del Jamón Serrano Español has been to offer the consumer the guarantee of genuine and highest quality Jamón Serrano from Spain. Our commitment to quality consumer satisfaction can be seen in our strict regulations regarding product, audits, inspections, quality control standards and selection processes (carried out piece by piece), therefore allowing us to guarantee the quality and exclusivity of our genuine Jamón Serrano from Spain that can be identified by our ConsorcioSerrano Seal of Approval. 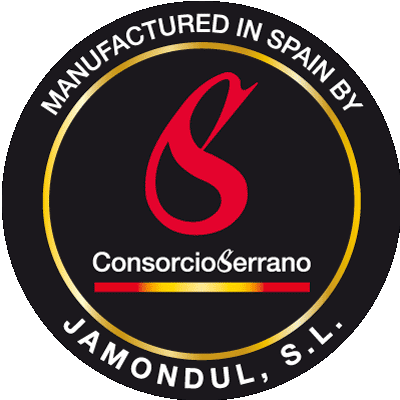 Our ConsorcioSerrano Seal of Approval guarantees a traditional and unique Jamón Serrano that is always prepared in Spain and with a taste and texture that makes it different from the rest of the Jamón Serrano that can be found on the market.